Because of this, the Eitaikyo can be seen as the temple’s promise to propagate in perpetuity. However, the temple is also a place that helps us to understand that what makes it possible and meaningful for the temple to propagate is all the people of the temple’s past and their concern for the future that helped to make the present and the future possible. The Dharma, the Nembutsu, is the teaching that gave the people of our past the strength to live their lives. It is also what gave them hope for the future that we are all now a part of. As a way of assuring that the temple is able to propagate in perpetuity, and to continue the process of receiving and sharing, the temple reminds us to appreciate the gifts from our past by remembering and honoring all those who made the Nembutsu a part of their lives and to honor their wish to share this Dharma with the future. This Dharma is shared as part of the temple’s daily morning service. It is what is shared at the temple’s monthly memorial service. 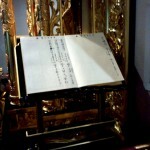 It is shared annually at the temple’s Eitaikyo Service. During the daily morning service, the pages of our Eitaikyo book are turned to the appropriate page that marks the day and month. Names are recorded into the Eitaikyo book when the family honors the wishes of the deceased to help the temple propagate in perpetuity by making a donation to the Eitaikyo (endowment) fund. 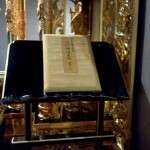 After the service, the names found in the Eitaikyo book are read to remember the gift of both life and the Nembutsu. At our monthly service, names of all those who have had a connection with the temple are read. At our annual service, the temple takes the time to remember all the individuals who have had a connection with the temple and who are no longer physically with us. Although names are not read at this service, the temple takes special time to remember their lives and to share the Dharma, the Nembutsu, that those of our past continue to help the temple propagate. The temple is helped to have the dream of sharing the Sutra over many long generations because over many long generations the temple has already been helped to share the Sutra. This is part of the living legacy of the temple.